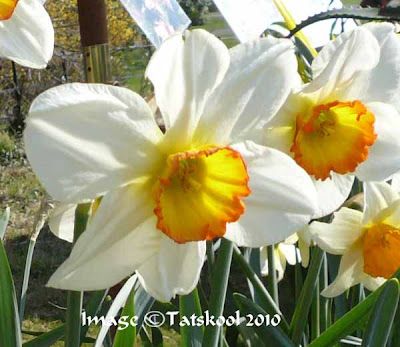 TATS A KOOL CHALLENGE: More Daffodils! Interesting Daffodils keep appearing in my garden and elsewhere. A couple of Sundays ago when we were having 'Summer', we went to a 'Rare and Unusual PlantFair', in the grounds of Fota House. Last time we went to this, two years ago, there was constant rain and the ground was nothing but mud,but this time it was such a pleasure. Traders came from all over the country and over the water too. It doesn't look very big in this photo. The field was packed with cars, well over a thousand people came I think. Maybe I will show you more of what we bought another time (not all that rare or unusual really!). 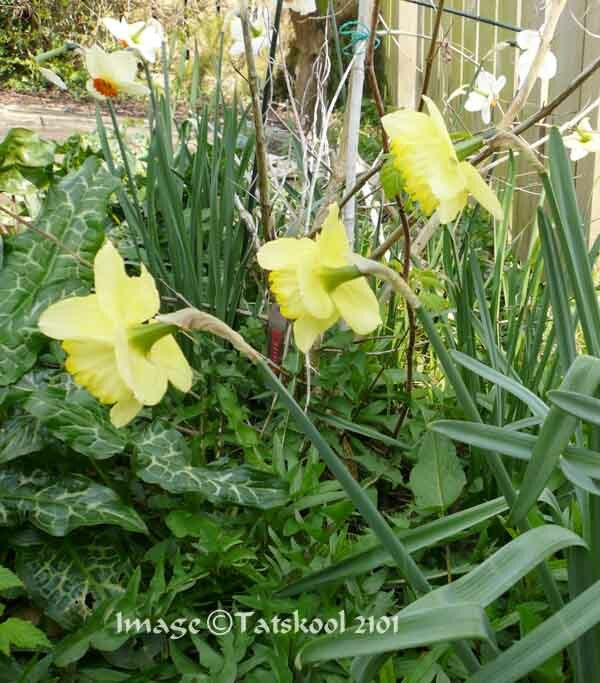 just wanted to show some Daffodils that I spotted. Worth a close up of the gorgeous shading in the trumpet. Later my garden revealed these beauties. Look how short and flat the trumpet is, and how the petals angle backwards. ......and another. 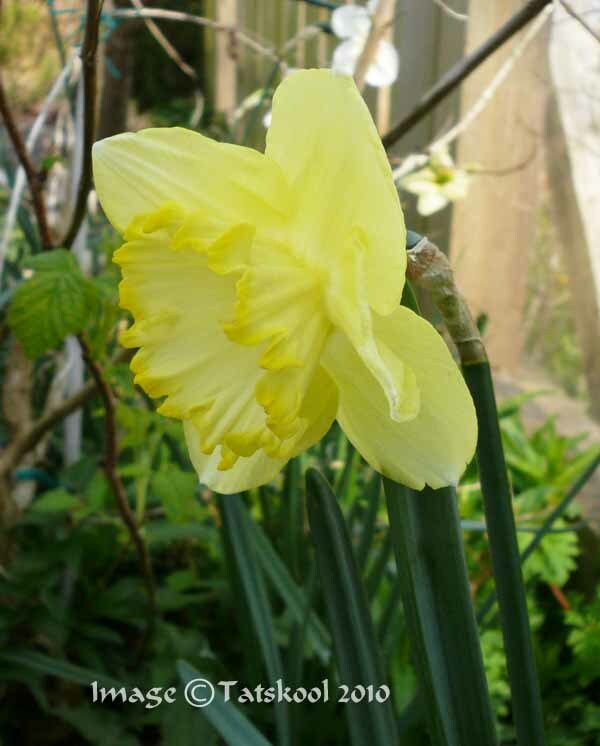 very pale lemony green colour with a short frilly trumpet. Very different from the Golden yellow ones. OK I will get to the point...you came her to see tatting! Some weeks ago....here I showed you the start of Vinnie's Spring Doiley 2. 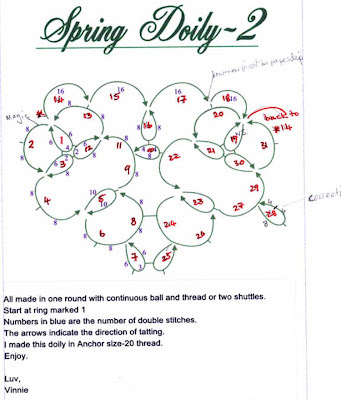 Vinnie showed it on her blog together with her diagram that I added numbers too. It made it so much easier for me to follow the ins and outs of the design. My doiley was made with Coats Floretta 20 which is a 3 cord thread slightly thinner than a Coats Mercer 20. It took 8m on the shuttle and 8.5 m on the ball...a total of 16.5m. I decided that I would prefer to use 2 shuttles as doing SLT's has spoiled the curve of some of the chains. 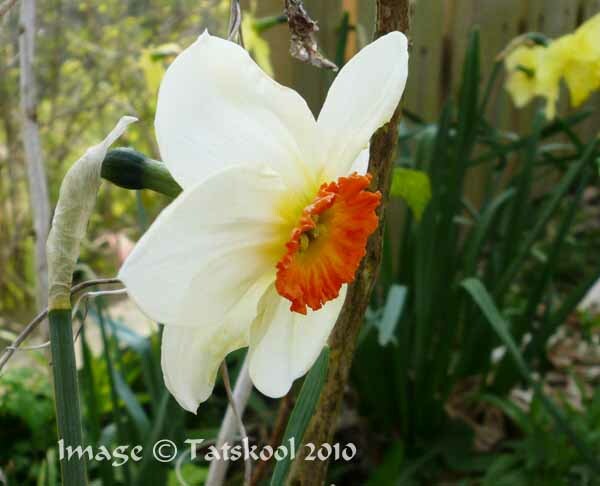 Since she calls it a Spring Doiley.....it was shouting at me to tat it in spring colours...and there is nothing more spring like in my stash than Daffodil Dell. I really like the effect, it's a perfect foil for a varig. thread as it doesn't detract from the design. I like the clean lines for a change, no picots and lots of open spaces. The doiley took...Coats Mercer 20 Sh1 7m, Sh2 11m. It measures 12cm, 4 and 3/4 inches. I would love to make this again using Just Daffodils for the rings and a solid green for the chains. 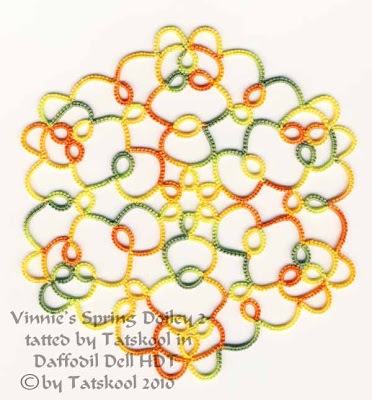 Stay tuned for more tatting with Daffodil threads coming soon. Love the daffodills - looks like a good time was had. Now I may have to try this doily too! Daffodills are so pretty! I love the colors in your Daffodill threads! The doily looks so nice in the Daffodill threads, just perfect. 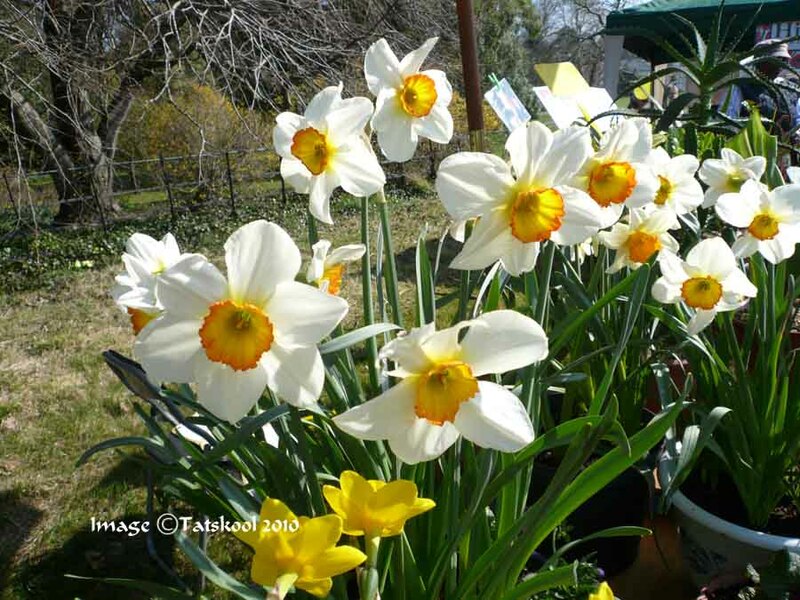 daffodill dell is such a perfect combination for spring and summer. It also suits Vinnie's pattern to a Tee. 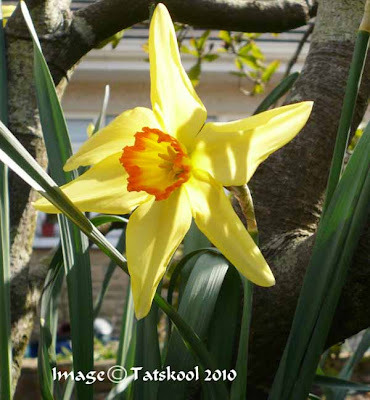 My daffodils aren't out yet so it made me happy to see the pictures. Those Daffodils are absolutely gorgeous and I love there colours. And the doily is really Spring looking!!!!! I cannot express how much I love Daffodil Dell and Just Daffodils. Positively perfect for Spring! 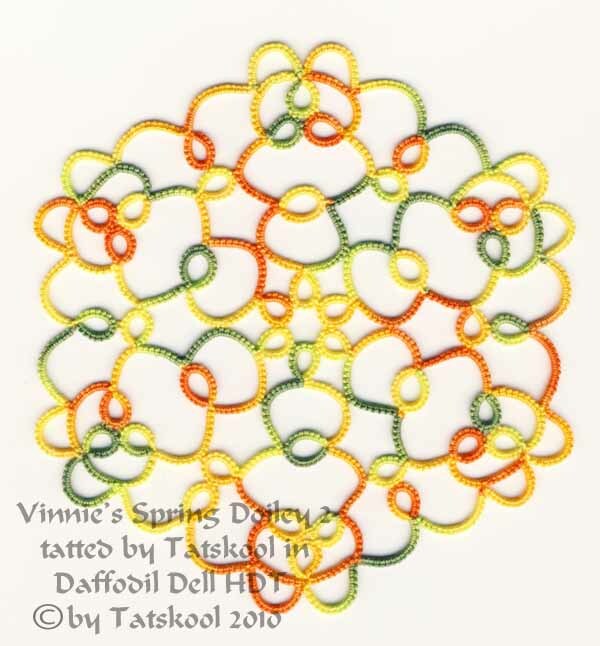 I haven't been brave enough yet to attempt Vinnie's Spring Doily, but it is on my must-do list! *sigh* Not enough tatting time in the day. Isn't that always the way? 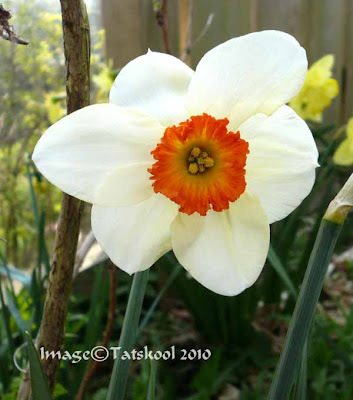 Thanks for sharing the gorgeous photos of daffodils and tattings. They are so cheery! Sorry, I haven't been reading my mail for a long time, I've made the amends as you asked me to. Your Daffodill threads are just awesome!!! 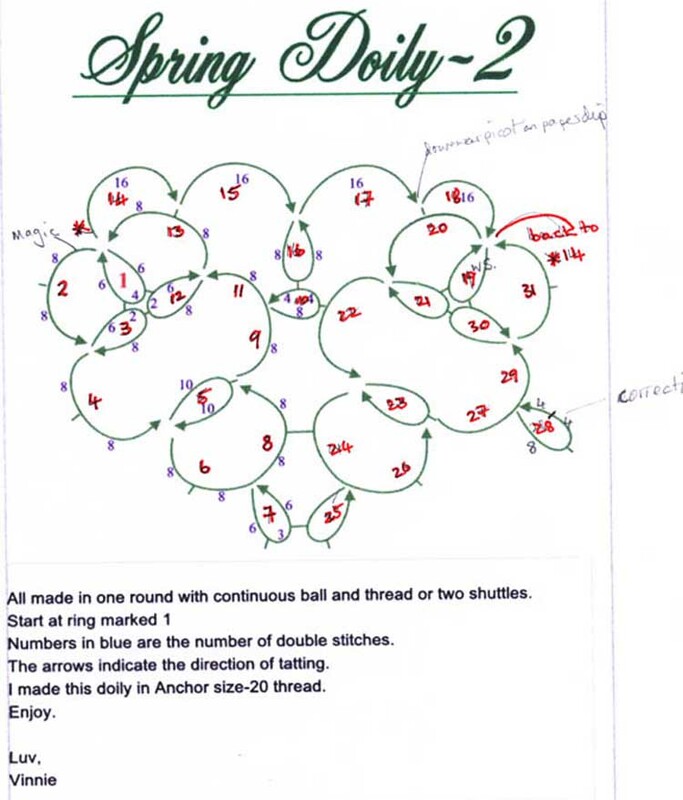 Those are just perfect colors for the 'Spring' Doily. Hi Magic Shuttle, I am so glad that i was able to help as it is such a glorious pattern. Thanks for showing me. Feargal in Toronto and the story of Maebh!